The Black Edition of Hans J. WEgner’s Minimal Chair (PP701) is finished in black lacquer on beech and upholstered in Elmosoft leather. The chair can be placed well under the dining table when not in use, thus saving floor space. Thanks to the shape of the backrest, one can sit all the way back in the seat and draw up close to the edge of the table. 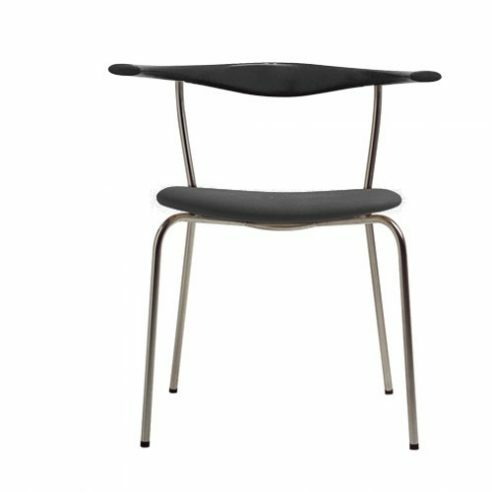 The black top rail and upholstery are complimented by the stainless steel frame and thus can be considered related to the Swivel Chair (PP502). As to the shape of the backrest, here, too, there is a clear similarity with the so-called ‘livestock chairs’, that is, the Cow Horn Chair (PP505), the Bull Chair (PP518) and the Buffalo Chair from 1957. Guild Exhibition, for which he received a 1,000-kroner exhibitor’s award. At the time he considered using it as a dining room chair in his new home, possibly in a wooden-leg version. He brought it home, but didn’t change the legs. It was a very light dining room chair with a steel frame, upholstered leather seat and a beautiful top rail where the joints between its’ four parts are accentuated with thin bands and mortises highlighted in dark wenge, a tropical African hardwood. Here the cabinetmaker’s artisanship is plain to see in a very demanding construction that stands out clearly and precisely where the use of dark wenge forms a visible separation between the four pieces of lighter wood. The chair was not newly created in 1965. Rather it was the culmination of a long process dating back to the first version that was designed and exhibited in the late 1940s. The second version was presented in 1955 in Helsingborg, Sweden, at the ‘H55’ all-Nordic architecture and furniture exhibition. Finally the chair gained a foothold with its third version in 1965.